Sudan has twice the number of pyramids in Egypt. Hard to believe right? Most of the time, when someone mentions Sudan, all one tends to think of is a war torn desert – plagued by genocide, refugee crisis, and a civil war. More than 250 pyramids were built in Sudan, to the south of Egypt, during the ancient reign. That’s more than double the 120 larger pyramids constructed in Ancient Egypt. In fact, Sudan contains some of the most humbling remnants of an ancient era – an adventurous traveler’s dream. However, in light of recent events and the turmoil surging through the country, it is unlikely that Sudan shall get the attention it deserves as a tourist spot. Nubian Pyramids are pyramids built by rulers of the ancient Kushite kingdoms. Kushite emperors ruled as pharaohs of the Twenty-fifth Dynasty of Egypt for a century until they were expelled by the Assyrians. The area of the Nile Valley called Nubia (which is in present day Sudan) was home to three Kushite kingdoms. The first kingdom had its capital at Kerma. Kerma was Nubia’s first centralized state with its own indigenous forms of architecture and burial customs. That last two kingdoms, Napata and Meroe, were heavily influenced by ancient Egypt culturally, economically, militarily and politically. The Kushite kingdoms competed strongly with Egypt economically and militarily. In 751 BC, the Kushite king Piankhi overthrew the 24th Dynasty and united the entire Nile valley from the delta to the city of Napata under his rule. Approximately 255 pyramids were eventually constructed at three sites in Nubia over a period of a few hundred years. These pyramids served as tombs for the kings and queens of Napata and Meroe. 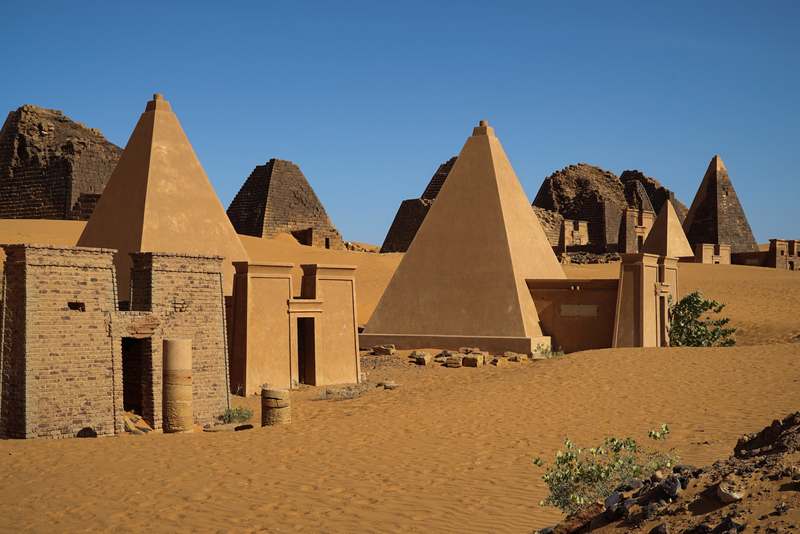 Nubian pyramids differ from their Egyptian counterparts in several aspects. Nubian pyramids are built of stepped courses of horizontally positioned stone blocks and range from approximately 6 to 30 meters in height. Given the fairly small foundation footprints, the overall structure is a tall and narrow one inclined at around 70 degrees. Most pyramids also have offering temple structures abutting the base with unique Kushite characteristics. All of the pyramids of Nubia were plundered during ancient times. The royal occupants of these pyramids were mummified, covered with jewelry and laid to rest in wooden mummy cases. At the time of their exploration by archaeologists in the 19th and 20th centuries, some pyramids were found to contain the remains of bows, quivers of arrows, archers’ thumb rings, pottery, colored glass and many other artifacts. The pyramids were further damaged in 1830s thanks to the exploits of Italian doctor-turned-explorer and treasure hunter Giuseppe Ferlini. He blew the tops off about 40 tombs during his quest for treasure.